You might think that my favorite thing in the world is food. Well no, you know that my favorite thing in the world is skating. But next to skating, my favorite thing in the world are taxonomies. Honk if you love taxonomic schemes! Beep beep! 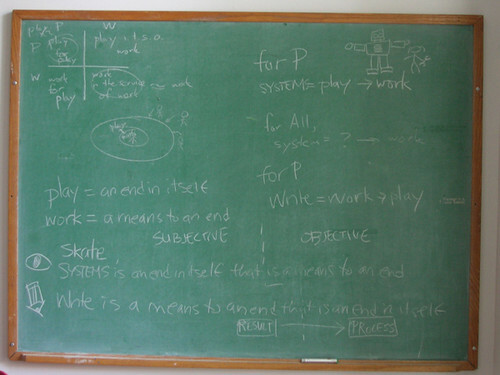 My friend Tommy and I worked out this work/play scheme last summer, we wrote it up on the chalkboard and everything. Work that is work = WORK = something that is done as a means to an end that is a means to an end = not even work, my job, fully falls into this category, if I think too hard about this, but yeah, doing my taxes, most definitely, stuff like that. But let's be real, working at the office still counts as work that is work. Work that is play = HOBBY = something that is done as a means to an end that is an end in itself = for me, my incessant making of schedules, definitely a means to an end, but also I do it just to do it. Play that is work = PLAY = something that is done as an end in itself that is a means to an end = for me, skating, which is good enough just as a "peace out" sort activity, but also happens to improve my fitness, and actually is a little second job. Play that is play = PASTIME = something that is done as an end in itself that is an end in itself = this is your real "just for fun" category, for me, watching tv series mostly, that is when I am totally checked out. Speaking of, I have to get back to it.